The nature and desert serenity of Todd’s backyard should be the perfect setting to experience the beauty and joy of Spring. The trees and plants are lush with new growth. Buds are bursting out on the cactus and the smell of orange blossoms fill the air. Especially nice, every Spring, are the migratory birds that travel through the area! We see new faces ‘n’ feathers every year….but they don’t stay long. These travelers know a dark secret that most might miss amidst the flurry of Springtime merriment. And that, my friends, is…..murder! Yes…MURDER…. 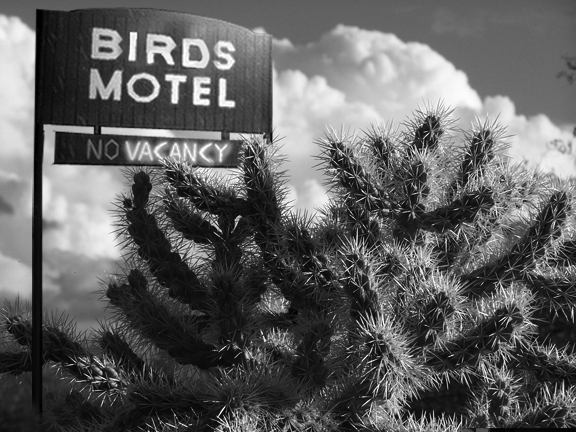 It all started when the young bird carefully built her first nest, choosing an unassuming yet respectable place in a nice big cholla cactus. 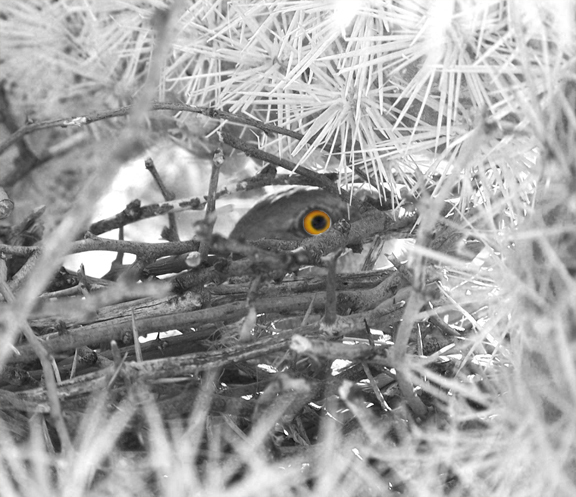 She laid her eggs and waited for them to hatch…she was young and innocent then. So happy, when her chicks came into the world that spring day long ago! But, that very night, her beloved children were gone when she returned with food. All that was left, was one tiny leg and a pile of bloody feathers! Her heart was broken. So, she abandoned the first residence and she built another. This time, higher into the spines of the cactus…surely this would protect them from the evil that dwells in the night! But once again, her children were brutally killed, one before it even hatched! 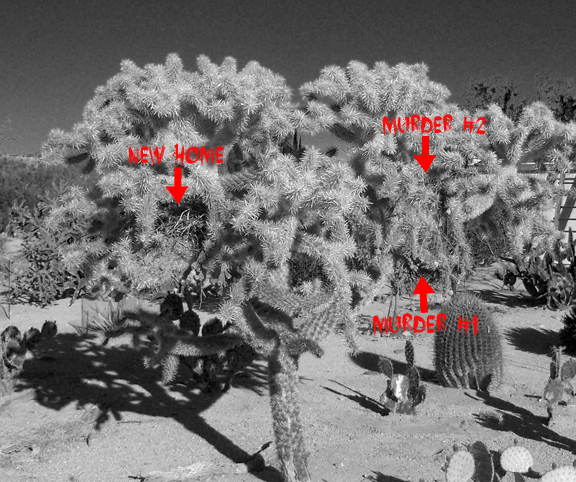 The sites of the first 2 murders. The grieving mother’s sadness turned to madness! She must build another nest…and another and another if she had too! She told herself, she will have a child that will survive, and she will do everything in her power to see that happen!! 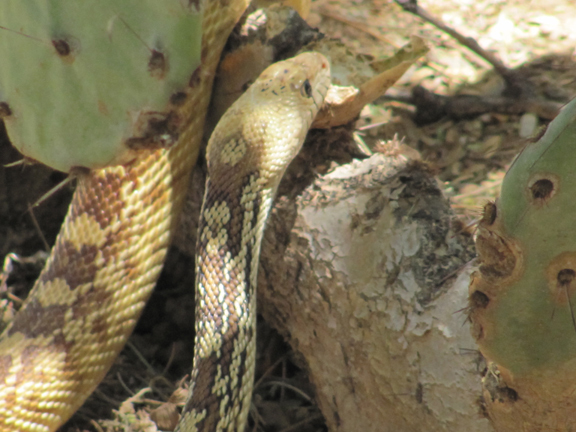 So she found another spot deep in the bowels of the cholla. There she built a fortress that could never be invaded by the forces of evil! She finally had a child, who she doted on until the day he left the nest. We will never know who committed those heinous crimes. But she does! Because now, unsuspecting young birds move into those nests and the monster returns to kill again! 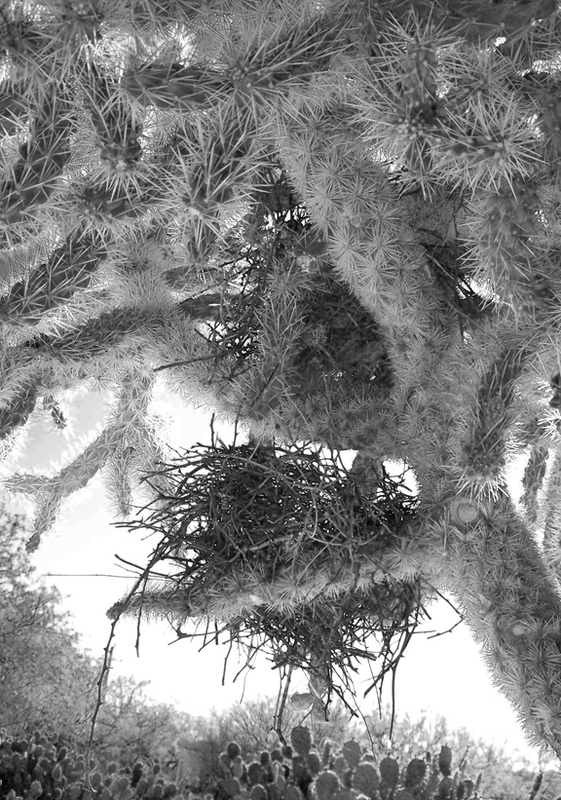 And to this day, the mother still sits in her empty nest and waits…. and watches the horrors that come out at night, in Todd’s Backyard. It was another muggy Monsoon afternoon in the mid-summer Desert. The humidity hung in the still air, the dark foreboding clouds collected in swirling pockets above Todd’s Backyard. Our skin crawled as deep thunder rumbled like warning drums….something wicked this way comes…. Family and friends gathered on the porch, cocktails in hand, awaiting the outcome of Mother Nature’s tricky plan. Rain, or not to rain? All was still, as the desert creatures stood in their heat beaten habitat waiting for the answer. It was then, that we heard it….A blood-curdling sound….a deep rasping….croooooooaaaaaaawwwk! Just then, a raindrop hit my arm, sending shivers down my spine. Another “Crrrooooooaaaaaawwwwkkkkk!” Then a small group wet drops splattered on the ground, followed by a burst of lighting and clap of thunder! The eerie desert drama started to unfold. Todd grabbed the camera to capture any evidence of the events to come. He made his way into the yard, amid the sporadic droplets of rain….Then, Todd saw it! So, hideous, he was speechless! Staring up at him from the depths of hell. Beady eyes glowing with wild anticipation of the rapture that awaited him. Soon his ultimate power would be restored with the one thing that he craved above anything. Human blood! Ok, not really!.. The thing he craved was rain. But he was not to be tempted out of his den, as the pitter-patter of rain came and went. The clouds parted. The sun returned. The creature retreated back beneath the earth to await the next croakin’ joke Mother Nature might have in store him. 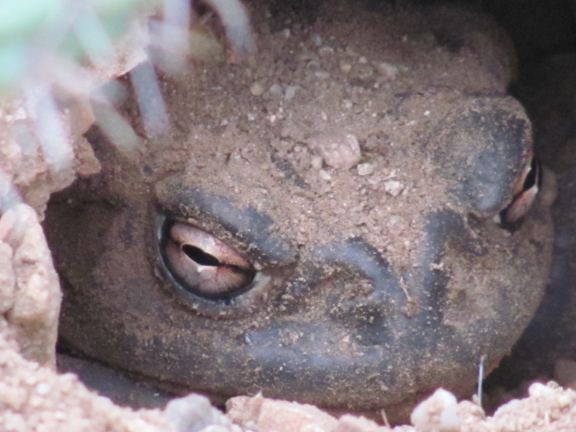 Perhaps, next rain, we will get a glimpse of his toadally ugly self! The creepy crawlers are coming out…well, they’re always out and about… but, with the approach of Halloween they seem to catch our attention just a bit more. 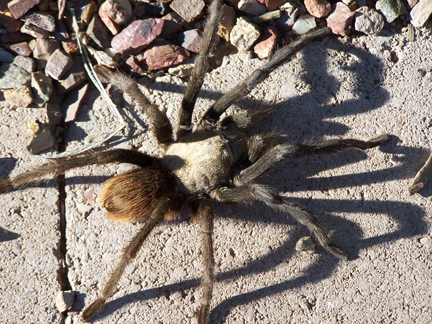 This past week, we’ve been collecting a few shots of our resident multi-legged mini monsters…. I swear these praying manitis’ are actually aliens! 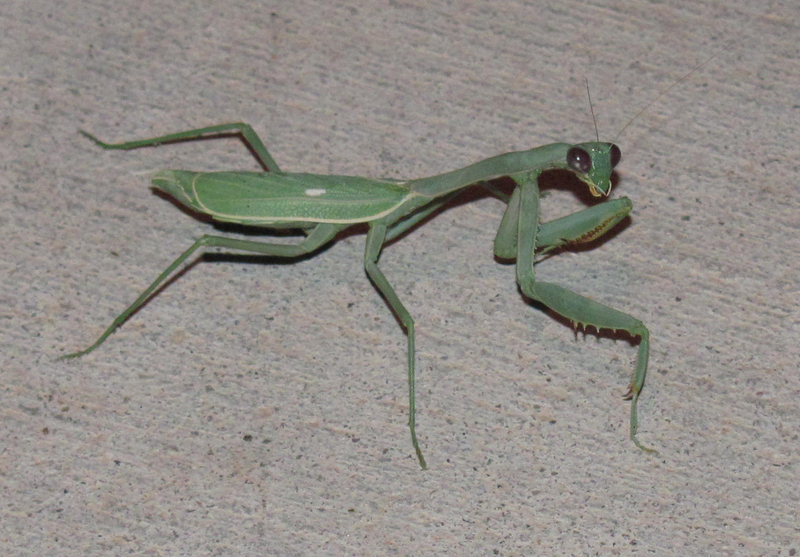 This little (big) guy greeted us on our front porch the other night. He seemed to listen to every word I said to him. After I took the photo and the flash went off, he got really friendly and kept trying to climb up my arm! I literally had to shake him off and run in the house! AAAAAHHHHHHH! I love these beetles….I don’t know what variety it is, but they are really cute! 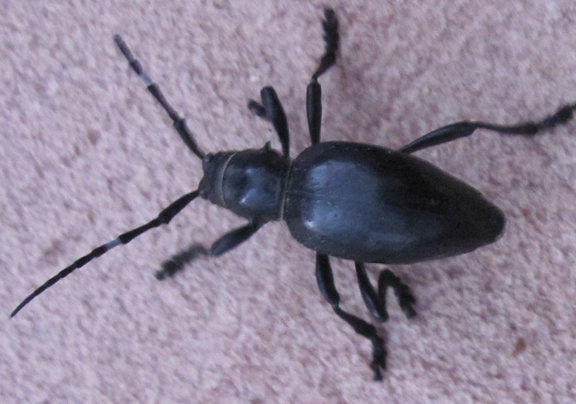 (In bug terms)… We see them occasionally toddling along the porch, their over-sized antennas swiveling around their heads like pointy radars. The dogs and cat will go give it a little sniff then leave it alone….maybe it’s a stink bug? 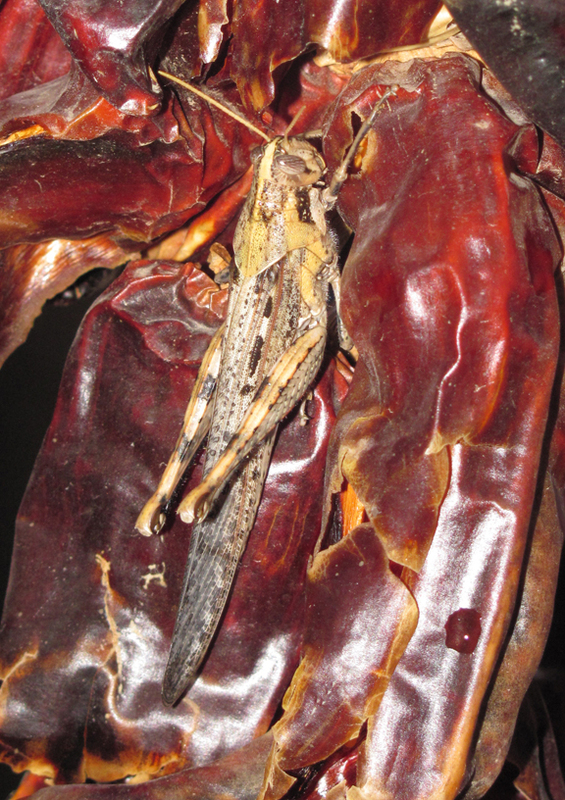 Yesterday, we found this humongus locust resting in our chili riesta. Probably seeking shelter from the big storm we had yesterday afternoon. 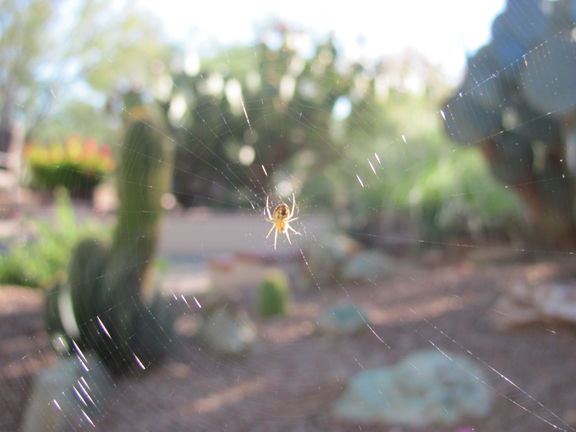 This little guy caught my eye, with his perfect web glistening in the sun. I can’t say that I really like the spiders, but this one did provide a perfect Halloweenish portrait. He come’s and shares a glass of wine with me almost every evening. 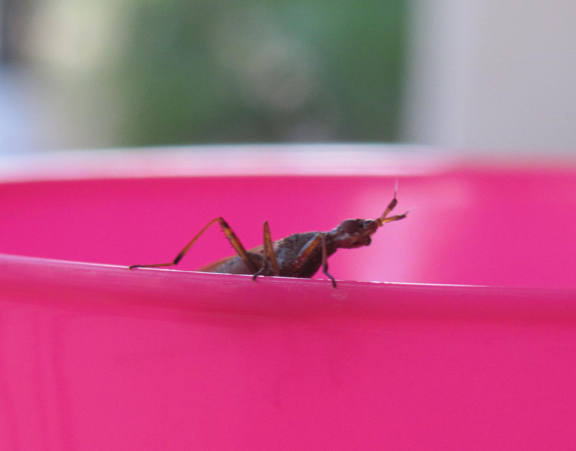 I have looked on line to find out what it is, but I can not find anything about this bug….I really do think this one is an alien…but that’s for another blog post! 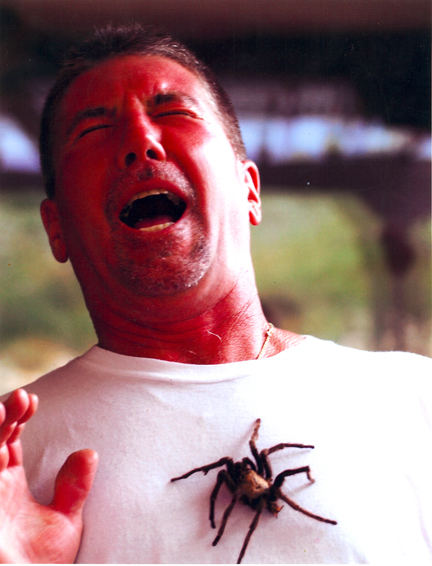 If anyone reading this knows what this bug is, don’t tell me….You’ll burst my buggy bubble! 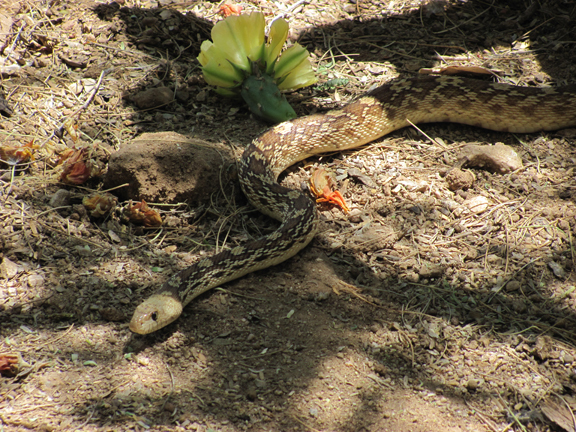 As we relaxed on the porch last Sunday, a friendly bull snake decided to come hang out with us. He likes to come up and cool off under our outdoor beer fridge. We discovered him there last fall. Todd had spotted his little tongue flicking from under the fridge when he went to grab a beer. We thought at first, it might have been a rattler, but after Todd stood on the counter and pulled the refrigerator out from the wall, we concluded that it was not. 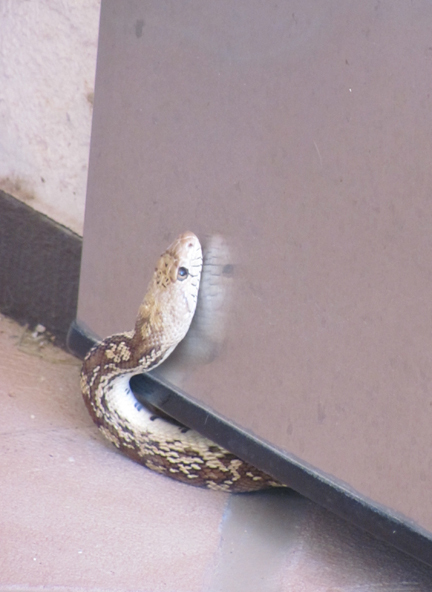 Mr. Snake comes to his ‘cool’ hideout on a regular basis, but he’s a little shy about approaching when we’re sitting on the porch. 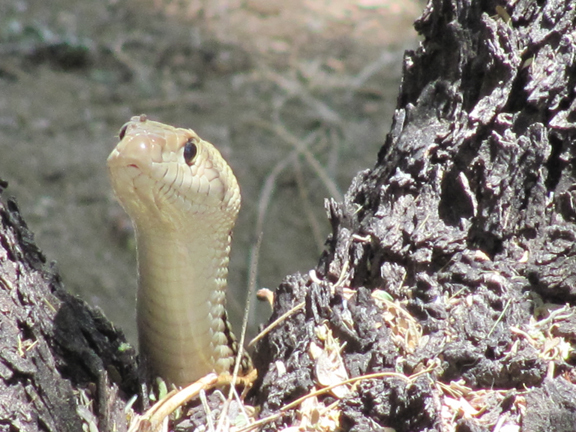 Sunday afternoon, we first spotted the sneaky snake making his approach from under the mesquite tree on the side of the porch. So he finds an inconspicuous spot to observe and wait for the perfect timing to make his approach. ‘Cause Mr. Snake wanted to be the bartender! Maybe not ‘roll’…more like Chop! Yikes! 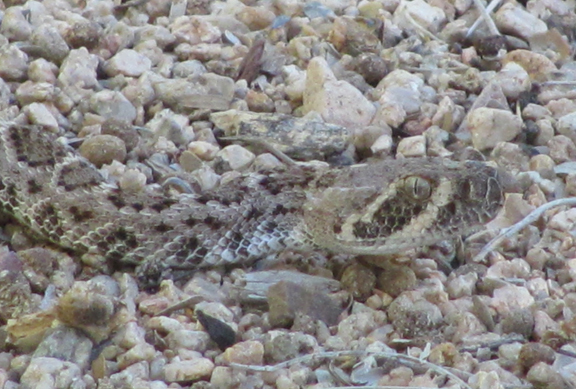 The first rattlesnake of the season….Todd stumbled upon it while feeding the birds. His attention to detail probably saved his life! I don’t think I would have seen it! 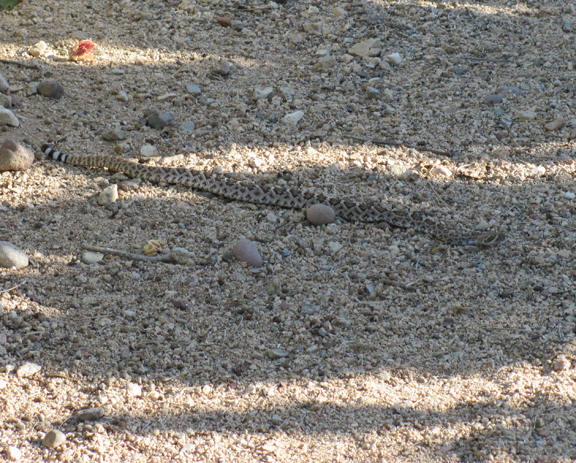 The snake was a good 2 + feet long. After the rattler was spotted, our dinner guests scrambled for their cameras…My mom was frantically trying to get the dogs and cat in the house. Todd gets the shovel. I get the close up…. Before we had time to consider any options…Todd went into action…Whack! Off with his head! ( terribly sad, but necessary)…Honestly, it’s either him (snake) or the dogs/cat/us! 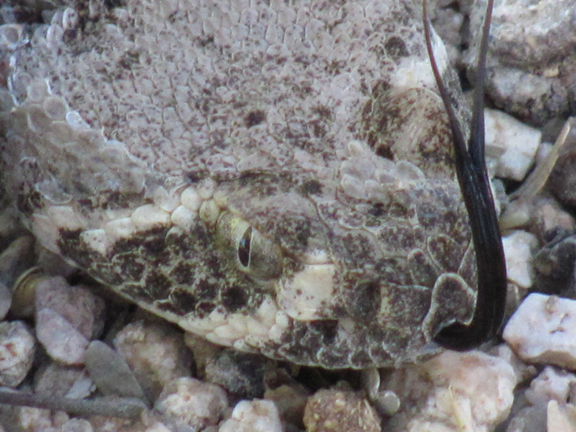 I seriously don’t want to experience a rattlesnake bite inflicted upon any of my family, friends or pets! From what I’ve heard, it is an incredibly painful and effed up experience- possibly deadly, certainly to pets! After the execution, the head went into a frenzy for several minutes- flicking it’s tongue and flopping around- truly horrifying! 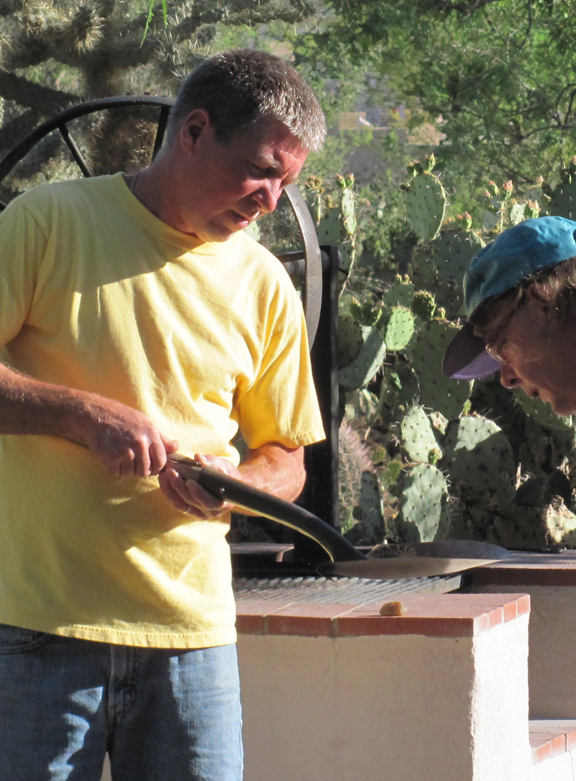 Our freaked out dinner guests had to examine the remains before Todd threw the snake on the grill to add some local fare to the night’s BBQ! We’ve witnessed a lot of amazing things in Todd’s Backyard, but this had to one of the most creepy/crazy things we had ever seen…. Oh yes, it was love at first bite? 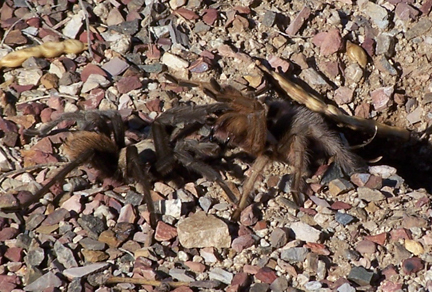 As Mr. Tarantula wandered past the female’s burrow, she literally leapt out and pounced on him! 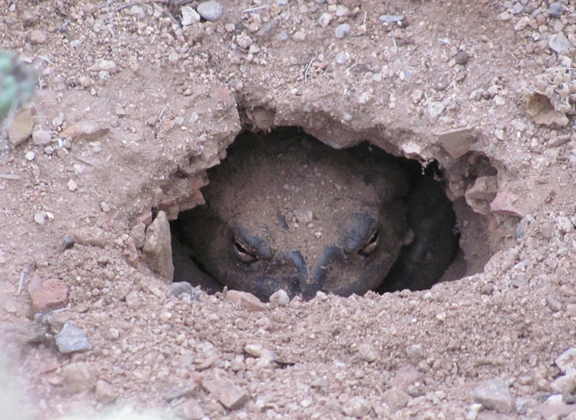 A ‘struggle’ ensued for about 10 minutes, then the female went back in her hole and the male wandered up to the porch. Now, I’m told that the female bites the male, and the male dies. I guess at least the little guys have their 10 years of life prior….what a way to go out! The female apparently lives for up to 20 years! Come out! 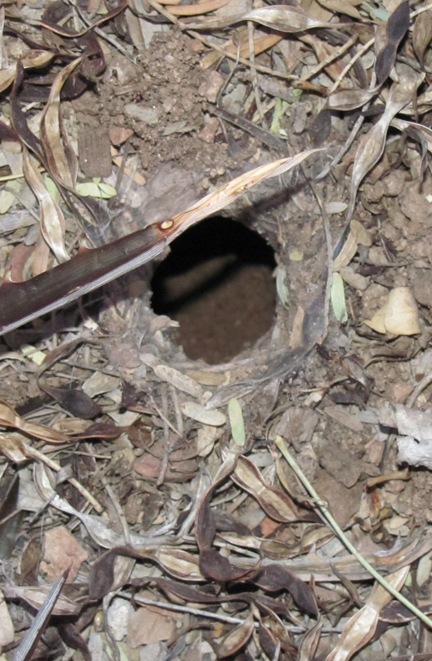 Come out, where ever you are!…We’ve recently noticed this new burrow, so perhaps we will get to see our furry little friends again! Follow Todd’s Backyard on Facebook! Todd's Backyard SHOP From T-shirts to postcards-all kinds of products with graphics/art created from Todd’s Backyard! Madness and Miracles…and More Madness!